It's all about money, welcome to the pro rugby era. While people bag this rule with the All Blacks only being available for selection if they are playing for New Zealand teams, it seems to be working and some other countries like England are being shown up because local players's paths are being blocked. It is one of those things that is only realised in the long term. Rugby is a sport indissolubly joined the beer (the reason for the third time). There are a very few beermats with topics of rugby. 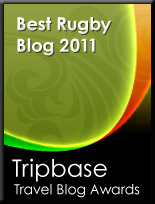 I invite you to see it at http://posavasosderugby.blogspot.com/ and to add new beermats, comments and suggestions.